Akira Isogawa is one of Australia’s most celebrated fashion designers. 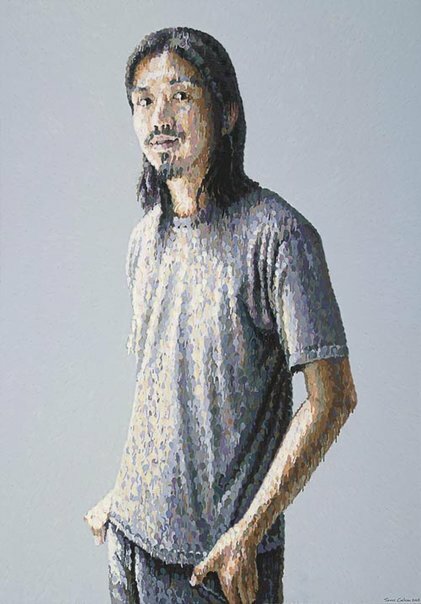 Born in Kyoto, Japan he moved to Sydney in 1986 where he studied fashion design. He opened his first store in 1993. Since 1999 he has shown collections in Paris and Sydney and has won international recognition for his exquisite designs with their soft, romantic silhouettes, natural fabrics and contemporary Japanese design influences. When it comes to portraiture, James Cochran finds that he draws greater inspiration from people working in the creative fields. ‘I had heard about Akira through my friends working in the fashion industry and the more I looked into his work and ideas, the more the idea of meeting him appealed to me,’ he says. The simple, textured background in the painting refers indirectly to the fashion industry with its textiles, catwalk and studios, and was incorporated as a way of heightening the colour and expression of the portrait itself. Born in England in 1973, Cochran has a Bachelor of Visual Arts (first class honours) and a Master of Visual Arts from the University of South Australia. He has participated in numerous group shows since 1997, including two at the Art Gallery of South Australia, and has had solo exhibitions at Melbourne’s Mahoney’s Gallery in 2007 and in Paris and Lille, France in 2006. He won the Prospect Portrait Prize in 2003 and undertook an Arts South Australia studio residency at Artspace in Sydney in 2002. This is his first time in the Archibald Prize.